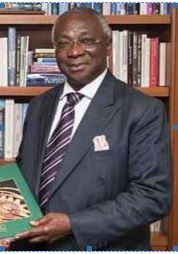 Chief Philip C. Asiodu CFR, CON, MA (Oxon), occupies a unique position in the history of the Nigeria’s public service. His career began from joining the Nigerian foreign service in 1957 through to Permanent Secretary, Ministry of Petroleum and Energy in 1975 when he retired. He was appointed a Permanent Secretary at under 40 years of age. He was adviser to President Shehu Shagari on Economic Matters in 1983 and a member of the Constituent Assembly in 1988 to 1989. He was appointed the Secretary (Minister) for Petroleum and Mineral Resources, 1992 to 1993 under the short-lived Interim National Government. Chief Philip Asiodu returned to the national limelight in 1999 when he ran as a presidential aspirant in the PDP. He was to become President Obasanjo’s Chief Economic Adviser from 1999 to 2001. Active in the private sector since he left public service, Chief Asiodu is a director of several companies in manufacturing, oil and banking sectors. He is a life honorary vice president of the Lagos Chamber Commerce and Industries, was president of Nigerian-German Business Council and a former President, The Metropolitan Club. Chief Asiodu left the nation’s civil service with the unofficial tag of super Permanent Secretary, a reputation largely associated with immense stature he acquired in government and the influence he wielded in public service. Chief Asiodu, a former President of The Oxford and Cambridge Club of Nigeria, is the current Grand Patron of our great Club. When members of yesteryears of The Oxford and Cambridge Club of Nigeria were deliberating on choosing a Grand Patron, the entire process could not have lasted too long nor did they have to look too far! His Royal Majesty Omon’Oban’EdoUkuAkpolokpoloErediauwa ICFR, MA (Cantab)was the unanimous and perfect choice; Charismatic, Upright and Versatile. Prince Solomon ErediauwaAkenzuawent up to King’s College, Cambridge to read Law and Administration (it is no coincidence that the only befitting College for a future monarch is theeponymous King’s College!). Prior to going up to Cambridge, OmoN’ObaErediauwa CFR had the throne as his cradle. Apart from the usual traditional palace tutorials which began at birth, Oba Erediauwa went to Government School, Benin after which he proceeded to Government College, Ibadan in 1939. Oba Erediauwa obtained, with flying colours, his London Matriculations which qualified him to gain admission into Yaba College in 1945. After completing his course at Yaba College, it was then that Oba Erediauwa went up to King’s College, Cambridge to read Law and Administration. OmoN’ObaErediauwa CFR returned to Nigeria in 1957 to join the Eastern Nigeria Civil Service as a District Officer (D.O.). Oba Erediauwa soon transferred his services to the Federal Civil Service and rose to the lofty position of Permanent Secretary, Ministry of Health, a position in which he discharged his responsibilities with the usual level of integrity and honour. Oba Erediauwa was a distinguished Diplomat and an effective leader. OmoN’ObaErediauwavoluntarily retired from the Nigerian Civil Service in 1973 and became the regional representative of Gulf Oil Company in Nigeria. With his unwavering appetite to serve, Oba Erediauwa was soon appointed Commissioner for Finance in the Military Administration of Major-General Innih in 1975 in the old Mid-Western Region of Nigeria. Oba Erediauwa’s early retirement from the Civil Service resulted in the Oba being exposed fully inthe intricacies of the administrative challenges that would confront him in the performance of his duties as Oba of Benin in later years. His father, Akenzua II, was Secretary to Eweka II, his father. Oba Erediauwa was not only schooled intellectually, but working closely with his father and the Palace protocols, affordedhim the opportunity to have first-hand knowledge of traditional issues that later arose as he realised his destiny as the Oba of Benin. On March 23, 1979, Prince Solomon ErediauwaAkenzua, was crowned Oba of Benin Kingdom in Nigeria. He succeeded his father,Akenzua II, and became the thirty-eighth king of a dynasty dating back to the thirteenth century. Oba Erediauwa ascended the throne of his Ancestors which, for over 1000 years, ascendance had been and is still is, by a system of primogeniture where the eldest surviving son of the king succeeds his father. Oba Erediauwa used his royal office to influence the welfare and fortunes of his people. He was the pillar around which the lives of his subjects revolved for decades. Over the years, Oba Erediauwa had discharged his responsibilities with much worldly wisdom and with dauntless courage. Since his ascension to the ancient throne, he had given effective leadership to his subjects. On his coronation day, he pledged to unite all Edo-speaking people including those in the Diaspora. His main focus was to re-establish the great Edo culture and tradition in line with acceptable norms of a modern society. There is no doubt that Oba Erediauwa emphatically succeeded in his pledge to unite the Edo people. The Oxford and Cambridge Club of Nigeria has paid several courtesy visits to its Grand Patron over the years and the last of these was in 2012. I was fortunate to have led the last delegation to the historic Palace in Benin. Not quite sure of what to expect, I think we were all pleasantly surprised and, to some extent, overwhelmed!The Oba received members of the Club in Court with his full complement of High Chiefs (each dressed in white and their necks adorned with the beautiful red coral beads typical of the Benin culture) and family members dutifully sat in their allotted position to the left of the Oba. A courtesy visitthat was billed for no more than 30 minutes ended up extending to well into a couple of hours with Oba Erediauwa regaling us with his time at Cambridge and the copious words of wisdom (his name was Solomon after all). At the conclusion of our visit, I had the privilege of handing over Oba Erediauwa’s Membership Card as an Alumnus of Cambridge University and member of the Oxbridge Club. Oba Erediauwa requested confirmation of his membership number, to which I promptly replied; number 0001 – Oba Erediauwa accepted the Membership Card with a wry smile (exhibiting once again his wonderful sense of humour). For those of us fortunate enough to have met the Oba in person, you could not but feel very honoured to have met such an intelligent, caring and strong individual. The Club kept the Oba involved and updated on the affairs of the Club throughout and Oba Erediauwa responded on one occasion, by sending his son, AmbassadorEhenedenErediauwa, to represent him at our May Ball (which is typically held in June). In our last communication, Oba Erediauwa personally signed a letter acknowledging receipt of our updates on the affairs of the Club. Again, such acts of kindness and sense of responsibility, showed the uniqueness of Oba Erediauwa. When Oba Erediauwa was crowned the 38thOba of Beninin 1979, Oba Erediauwa was 56 years old as he ascended the throne of his forefathers. On 29 April 2016, The Oxford and Cambridge Club of Nigeria received the news that Oba Erediauwa had gone to join his Ancestors. We were, of course, very sad on receiving this news but are equally comforted to know that Grand Patron, OmoN’ObaErediauwaN’EdoUkuAkpolokpoloCFR, MA (Cantab), has gone to join his Ancestors in a Golden Chariot with great pomp and ceremony befitting of a King! The Oxford and Cambridge Club of Nigeria is a non-profit association of the alumni of either University of Oxford or University of Cambridge. The Club was established over 30 years ago by a group of prominent Nigerians who attended either of the two Universities and wished to create a forum to encourage social, economic and intellectual debates in Nigeria. To date, we have on record approximately 250 active members spread across the country and engaged in different sectors of the society.Admittedly, we are exceptionally fortunate to have had His Majesty, OmoN’ObaErediauwaN’EdoUkuAkpolokpoloCFR, MA (Cantab), the Oba of Benin, a very respected and distinguished first class monarch of one of the oldest kingdoms in Africa, as theGrand Patron of The Oxford and Cambridge Club of Nigeria. On behalf of the Club, I humbly thank Oba Erediauwa for his unquantifiable contribution to the leadership of The Oxford and Cambridge Club, the Benin Kingdom and Nigeria as a whole. Respectfully for, and on behalf, of The Oxford and Cambridge Club of Nigeria. Sir Adetokunbo Ademola KBE, GCON, PC, SAN, MA (Cantab), was a Nigerian jurist who was the Chief Justice of the Supreme Court of Nigeria from 1958 to 1972. He was appointed as Chief Justice on April 1, 1958, replacing Sir Stafford Foster Sutton who was retiring. 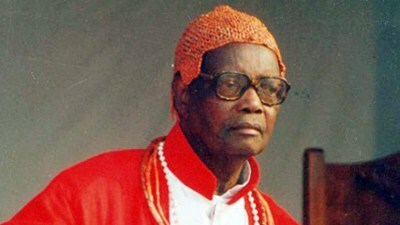 Sir Adetokunbo was born on February 1, 1906 into royalty as the son of Prince Ladapo and Tejumade Ademola. His father was a regent of the Egba United Government in Lagos and later became Ademola II, the Alake of Egbaland, Abeokuta, a historic walled city of Egbas in south-western Nigeria. Sir Adetokunbo had his primary education at Roman Catholic School, Itesi, Abeokuta and Holy Cross School, Lagos. He attended St Gregory’s Grammar School, Obalende and King’s College Lagos for his secondary school education. He completed his secondary education in 1925 and passed the Senior Clerical Examination for admission into the colonial Civil Service. He gained appointment as a clerk in the Chief Secretary’s office of the National Secretariat, Lagos. From 1928 to 1931, Sir Ademola studied law at Selwyn College, University of Cambridge. 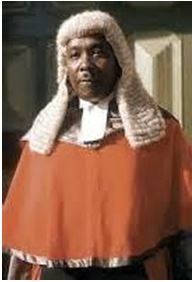 Sir Adetokunbo had a distinguished legal career culminating in his appointment as the first indigenous Chief Justice of Nigeria from 1958 to 1972. Sir Adetokunbo married the former Miss Kofo Moore, who obtained a BA at Oxford and was daughter of the late Eric Moore, first Lagos member of the United nations committee of experts advising on labor conventions and regulations. Sir Adetokunbo, a founding member and the first President of The Oxford and Cambridge Club of Nigeria, was the inaugural Grand Patron of our great Club.